This 3-5/8" big bore kit will increase the displacement of stock 80" Evolution big twin engines to 88" using the stock 4-1/4" flywheels. 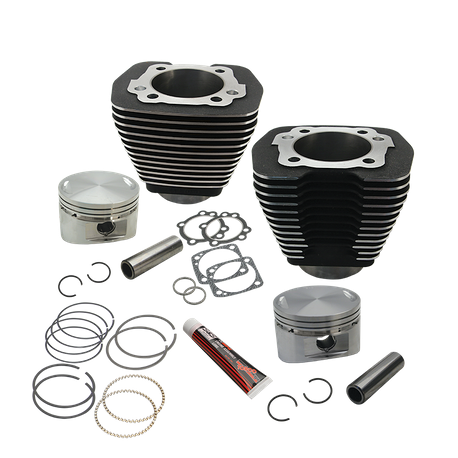 The kit includes S&S 3-5/8" borecylinders, 3-5/8" bore flat topped forged pistons with rings and wristpins, head gaskets, base gaskets, exhcaust gaskets, and instructions. The cylinders are shorter than stock, so shorter pushrods, and shorter manifold will be needed to complete the engine. Stock cases will need to be bored out to 3 5/8".